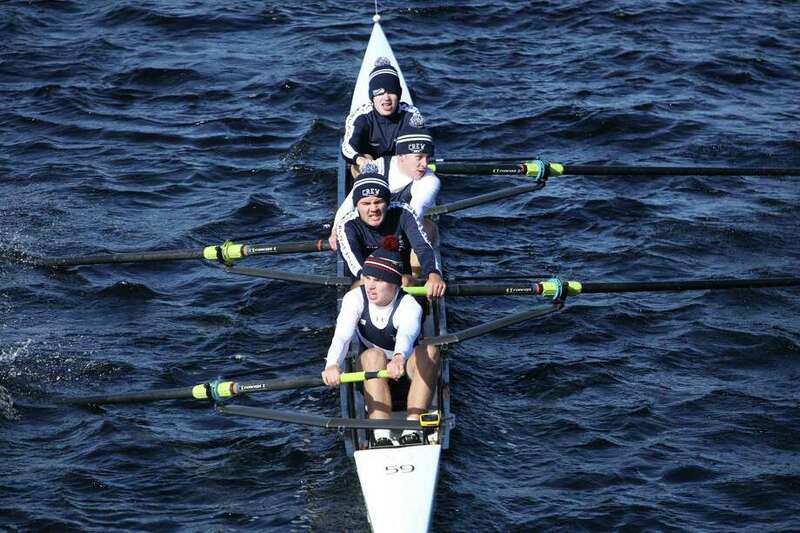 The Litchfield Hills Rowing Club, which has two members from the Greater New Milford area, recently participated in the 54th Head of the Charles Regatta on the Charles River in Cambridge, Mass. From front to back are, Anderson Warshaw of Warren, Antonio James Butler, Harley Harris, Frank Anctil of Warren and Faye DeVaux, hidden. The Litchfield Hills Rowing Club recently took five boats to the prestigious 54th Head of the Charles Regatta on the Charles River in Cambridge, Mass. Two Warren residents, Anderson Warshaw and Frank Anctil, participated in the Men’s Youth Four boat. Other youth that participated are from Bantam, Litchfield, Morris and Northfield, and New York State. Founded in 1965, HOCR is the world’s largest two-day rowing event attracting more than 11,000 athletes and tens of thousands of spectators. At a “head” regatta classification, the race is generally three miles long and the boats race against the clock and each other, entering the course at 15 second intervals. The course on the Charles River is known for its many turns and six arched bridges to navigate under. The Oct. 20-21 race is sanctioned by USRowing. This year there were a total of 2,308 entries from 805 Clubs from around the world. For the three Youth boats, the second day of racing brought weather conditions of colder temps, early morning rain, and late morning wind. Starting the morning in a Men’s Youth Single was Oliver Sanchez coming in at a time of 20:42.8, with a placing of 20th out of 36. Ruby Hatfield and Landry Langlais were in the Women’s Youth Double with a time of 26:36.7 and placed 40th out of 43. Earning seats in the Men’s Youth Four were Anderson Warshaw, Antonio James Butler, Harley Harris and Frank Anctil, coxed by Faye DeVaux. Their time was 19:55.2 with a placing of 60th out of 85. All but one of the youth participating are high school juniors. In other news, the Women’s Senior Master Eight, for ages 50-plus, had a guaranteed entry for their boat this year because of their top 50 percent placing last year, where they placed 12th out of 36. They continued to compete strong this year and placed 14th out of 44 boats with a time of 19:20.9, and once again guaranteed an invitation to race next year. Rowing the Eight were Renee Jones, Gail Zaharek, Wendy Baldauf, Ashley Shepard, Bridget Brody, Nicole Holly Stone, Sue Edelstein, Mary Ewing, and coxed by Becca Beldner. The second Master’s boat entered was the Women’s Master Double for ages 40-plus, and the crew that earned the seats were Katy Varga-Wells and Abby Doolittle. They came in 12th out of 15 with a time of 23:14.9.